Q: We have access to so much news on a daily basis. What kinds of information do you consume at the start of your day? A: I usually read mostly entertainment properties and scroll through twitter first, predominantly Billboard, Huffington Post and Hollywood Reporter. I do watch local news at night but often don’t pay a lot of attention! I think social media is fantastic for breaking news although I usually make sure more than one outlet is reporting something breaking before I believe it. Q: Tell me how you use social media? A: I use social media in many ways. I use it to do my job, I use it to be better at my job, I use it to pass time. I use it to know what’s going on around me. I use it to see what other people are interested in. I use it to make sure I am on point with things. It’s very useful! Q: How has social media changed your life? A: Because I used to be a publicist, and now I mostly provide content and strategy for social media, I probably use social media more than the average person. In that sense, it has very much changed my life! Q: Do you think social media has enhanced or diminished our personal relationships? A: I think about that a lot; On a personal level, I think it’s 50/50. In some ways, social media has made it easier to keep in touch with people you wouldn’t have crossed paths with otherwise. It is nice to see what people are up to and sometimes, if a person posts about an issue, you can help them or offer advice. In the same sense, it also takes the place of face-to-face interaction, because you’re getting what you need via social media. For brands (and that includes entertainment), I think it’s pretty amazing. The only thing that is somewhat frustrating is that social has become iso money driven right now (and people often don’t even know it), not that you could really blame them for capitalizing on that, but there are still opportunities to go viral, and when it happens, it’s magic. Q: What organizations, brands or personalities do you follow? What makes them worth following? A: Because I do this for work, I don’t follow as many personalities as you might think. That’s because I don’t really want to be influenced, either consciously or unconsciously, by what other people are doing. 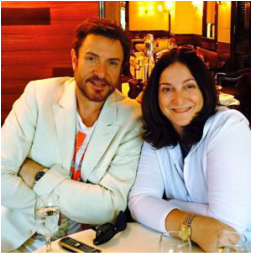 I follow the three Twitter pages I mentioned above in the first question, I follow Simon Le Bon (@SimonJCLeBON) because he’s my boss and he’s also pretty funny, I follow artists I am working with and I follow friends. I also like @socialtimes, @forbes and @Engadget. Q: What kinds of posts spark your interest? A: Anything funny and anything with a little bit of celebrity gossip (sorry!). Also anything that bashes T-Mobile because I loathe the company, which I’ve been very vocal about on social media. Q: What is/are your favorite social media platform/s and why? A: I think I have been favoring Twitter lately. I use Facebook to post photos of my children, and I do use instagram, but since I do Duran Duran’s instagram, and it’s a pain to switch back and forth, that’s less of a daily thing for me. I like Twitter but also have to be careful not to have too big a mouth! Q: Favorite hashtag or one you’d like to see? Q: What advice would you give to a brand about how to get started with a social media program or make their existing one more effective? A: I think the best piece of advice I could give is that social media should never be about numbers, it should be about engagement. You could have 2 million followers, but if they don’t engage, it doesn’t mean anything. That’s where Twitter is more useful than Facebook, at least for a brand, because you can engage customers and see how they feel. While Facebook is great in the ability to boost posts and reach people you’d not reach otherwise, Twitter is better for having conversations with consumers, in my opinion. Q: If you could follow any historical figure on social media, who would it be? Q: Cone, cup, or straight from the container? A: Believe it or not, I don’t love ice cream. My husband does though, so I will choose his – Häagen–Dazs Pistachio. Have something to add or share? Please leave a comment in the section below. Feel free to like and share on social media. And be sure to join us next week when our guest on Ice Cream Social is entertainment and culture journalist Melinda Newman, whose bylines have appeared in Billboard, Rolling Stone, Los Angeles Times, Variety,Entrepreneur and more. *Full Article: NorthStar Creative Communications + Marketing. NorthStar is a respected boutique communications and marketing firm led by versatile and visionary PR executive Sheryl Northrop. NorthStar’s diverse client roster includes important US and global corporate entities, non-profits, authors, recording artists and personalities, a testament to Northrop’s versatility and innovative approach.